BOW — A Derry woman faces drunk driving and other charges, after state police say she was clocked on radar driving 117 mph in a 55 mph zone in Bow with a teenage friend early Saturday. According to state police, New Hampshire State Trooper Anthony Pratt was monitoring weekend traffic along Interstate 93 in Bow around 3:30 a.m. Saturday when he reported seeing a vehicle traveling at an excessive rate of speed. According to state police, Pratt was able to clock the vehicle going 117 mph in a 55 mph zone. Pratt stopped the vehicle and determined the driver, identified as Kelly Murphy, 20, of Derry, was driving under the influence of alcohol. According to police, Murphy was arrested on charges of aggravated driving under the influence, underage DWI, reckless operation, and unlawful possession of alcohol. According to state police a passenger in the vehicle, identified as Marissa Palazzo, 19, of Derry, was also arrested on charges of resisting arrest and unlawful possession of alcohol. DAYTON, Ohio (WDTN) – A Dayton man was indicted Thursday on charges related to a crash that killed his passenger last July. 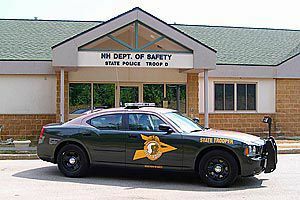 On July 14, 2018, around 1:40 a.m., troopers with the Ohio State Highway Patrol tried to pull over a Dodge Magnum for a traffic stop on Gettysburg Avenue. The driver, 38-year-old Thurston Melson, initially pulled over but quickly drove off and turned onto Oakridge Drive. He lost control of the car near the intersection of Geneva Road and struck an RTA pole. The force of the impact broke the vehicle in half. 35-year-old Ebony Radford, who was sitting in the front seat, was pronounced dead at the scene. Following the crash, Melson tested positive for both marijuana metabolite and alcohol.